Work the way you want with Seville Classics AIRLIFT XL Pneumatic Sit-Stand Mobile Desk Cart. This desk is height-adjustable with a lever operated pneumatic cylinder coated in a silver finish. Adjust the desk with the touch of a lever from 27.1 to 41.9 inches high. The rectangular top features an elegant white finish with inwardly beveled edges--it's also big, measuring 28.1 inches wide by 19.6 inches long. Mobility and stability matter, so we designed this desk cart with a rolling, wobble-free steel base; includes a pair of normal and locking 2.4-inch casters. 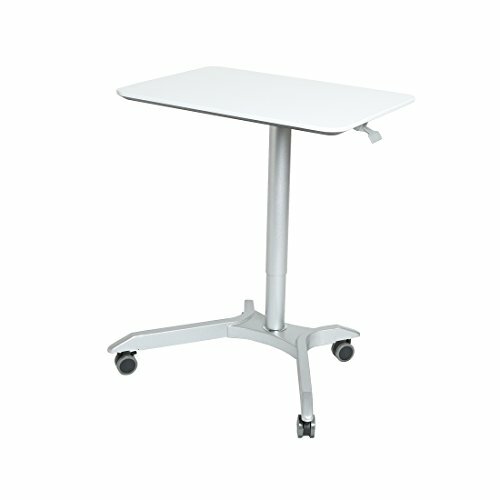 Use it your way: at home, as a computer table; in school classrooms, as a podium; or at work as an ergonomic alternative to standard office desks.